Sorry, Bri, move this if you want, but I couldn't find the original thread which I'm sure we had on this RR. Just had to say - wow, MJ. When you bounce back, you bounce back to rival Tigger on a high! Helen throws roses at MJ's feet. Hope that you guys didn't mind. We are lucky to share in your talent. Anytime you want to pitch in is fine by me. What's funny is my post was cut short! I had Sam and Al going outside, in the back yard... and other things I won't go into right now. MJ, thanks for coming on board! Ya breathed some life back in this sucker! Pssstttt.... it's "write" a note, not right a note! Re: What's funny is my post was cut short! HA! Did I really do that??? AGAIN?! You know, I guess if I did read back over the posts that I made, then I wouldn't have so many errors in them. Well I managed to get a whole day to myself and I've posted PART 12 to the Round Robin and (earlier than expected) Chapter 39 of A Time Continuum - The Wrong Turn. Hope to have more great days like today. BTW Helen, the original thread for RR3 is on the main chat board (page 5) took me ages to find it too. I noticed that too, but I didn't know what the deal was. I thought that it was like the experiement that was started. I hope that I didn't destroy an idea. *grimace* If I did, I'm truly sorry, Matt. Not a problem... just a lost opportunity. Was hoping to take it somewhere (as nobody had posted since Dec 15th) with a bang... instead it was a slight pop! LOL! Glad you picked up the story and took it elsewhere! Nailed you too, huh Sue? Somethings going on with EzBoard... From now on, I'll have to be a bit more careful when it comes to posting longer messages! Tell me where it is...I'll move it ASAP! In the fanfiction site, third down from the bottom. 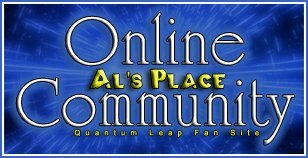 You might want to rename it, to go along with the others... something like Round Robin 1: (untitled) ... from the archives of Scifi.com/Quantum website! All done, renamed, and moved! Sue, I would LOVE to grab the next spot, but I am still clueless on what exactly you were trying to make Al go "aha!" about! I just read the whole round-robin, and I have to say, I really enjoyed it!! If I can think of anything, I'll make my contribution, too. <G> Great work so far! that would be nice, Mike! I'm kinda stuck (shamed a bit to admit it!) I DO have a workaround, though... and can post it, but I think the story will suffer a great deal because of it!